Review posted January 6, 2016. Alfred A. Knopf, New York, 2015. 169 pages. The wise rabbi who wrote When Bad Things Happen to Good People is 80 years old, and he has some wisdom to share with the world. 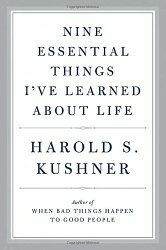 Even though I’m not Jewish, I can see the deep wisdom in most of the “essential things” Rabbi Kushner talks about. I have a few minor disagreements with some theological points. (Most notable is that I do think thoughts can be sinful even without actions. What does he do with the commandment “Thou shalt not covet”?) But overall, I find myself filling this book with post-it notes marking outstanding quotes. May we benefit from his years of experience and his wisdom. In the first chapter, he talks about the influences that shaped and changed his view of God from the theology he was taught as a child. More than anything else, my half century of congregational service and my dozen or so books have been dedicated to reformulating that traditional theology. I’ve done this not to protect God from bad theologians and people’s righteous anger, but to rescue people who need God from having to choose between a cruel God and no God at all. The God I believe in is under no obligation to be the kind of God we would like Him to be, or even the kind of God we need Him to be. Begging Him, bargaining with Him, even living by His mandates will not cause the rain to fall and give us an abundant harvest, nor will it cure our disease or help us win the lottery. God’s role is not to make our lives easier, to make the hard things go away, or to do them for us. God’s role is to give us the vision to know what we need to do, to bless us with the qualities of soul that we will need in order to do them ourselves, no matter how hard they may be, and to accompany us on that journey. Check Sonderquotes for some bits of wisdom. If you like what you read, I do recommend this book. Read one Essential Thing each morning, and you’ll be uplifted, encouraged, and motivated. But with it all, I choose to love you. I love you, whether you deserve it or not (and how does one measure that?). I love you in part because you are the only world I have. I love you because I like who I am better when I do. But mostly I love you because loving you makes it easier for me to be grateful for today and hopeful about tomorrow. Love does that. There. Simply typing that out made my day suddenly much better. Rabbi Kushner is right. And there are many more wise gems where that came from.